Gygax intended AD&D to be played with miniatures. Miniatures on grid maps are assumed for travel (DMG, 10), for combat (DMG, 49, 69), for understanding scale (DMG, 10-11). To put it in Gygax’s own words, miniatures “add color to play and make refereeing far easier.” Theater of the mind, as I have found, is very difficult if you’re using the sorts of ranges provided in games like AD&D 1e. The combat system works remarkably well with miniatures. To be quite frank, combat with miniatures works smoothly and seamlessly in this system. My players picked it up almost instantly. Once they figured out initiative, they were cruising. It’s just natural to use the combat rules-as-written with miniatures. It was designed that way. But what if you don’t use miniatures? For starters, you’re going to have to throw out a bunch of combat rules and come up with replacements. We tried going “theater of the mind” with another edition of D&D and it was a nightmare. Why? A ranger needs to know his range, before he can roll his attack. A magic-user has a specific range for his effects. When it’s in the theater of the mind, it’s just a nightmare to keep track of in those terms. That is, unless you want to reinvent the combat mechanics. And who really has time for that? How can you get miniatures without breaking the bank? For some people, purchasing, constructing, and painting miniatures is a hobby in and of itself. This is a huge part of tabletop wargames, like Warhammer 40k, Hordes, Bolt Action, and the like. And, as you likely know, AD&D grew out of wargaming. Thus, it’s unsurprising to find Gygax saying, “Details of preparation and painting of miniatures figures for the game are not germane to this work. Your hobby supplier will have an assortment of small brushes and paints for such purposes, and you may inquire there as to the best techniques of painting.”I’ve dabbled in painting miniatures. I’m glad I’ve painted the ones that I have painted. Especially my D&D PCs. But if I was painting all the monsters, NPCs, and the like, I’d get tired of it. Others wouldn’t. If you’d like to read more on painting minis, I strongly recommend Brent Brown’s “Color Spray” available on the Mad Adventurers Society.So if I were you, I’d paint one or two and see if you like it. Then, determine whether you want to commit to painting them all or not. Determine your personal approach to miniatures: pre-painted (or no paint) or paint yourself. If you’re a player, I don’t want you to expect your character to die. Even though it’s quite possible they will, given the lethality in early levels. I think there’s something really engaging and immersive about painting your character, or even just having a good miniature. Why? Because even when they die, you still have that physical memento. I’m looking at mine on my shelf right now and they bring back memories instantly from campaigns. It’s very cool.That said, if you’re a DM, looking at cranking out $100 for a sweet dragon miniature, ask this question: “Am I only going to use this once? And, if so, will I enjoy this as a centerpiece on my gaming table?” There’s nothing wrong with spend $100 on a miniature that you use one time…if that’s what you want to do. I’d be hard pressed to crank out that kind of cash on something that will be a paper weight for most of its life.So decide how long you think you’ll use your miniature. Once you know your personal approach (paint or not) and your lifespan (limited or potentially long-term), then you’re ready to make your purchase! Reaper makes great minis. They’ve been working to reduce costs by putting out plastic in addition to the metal miniatures. Mirliton, out of Italy, gets points for nostalgia. Not only do they own the molds of the original D&D figures, but they continue to make miniatures in the old style. 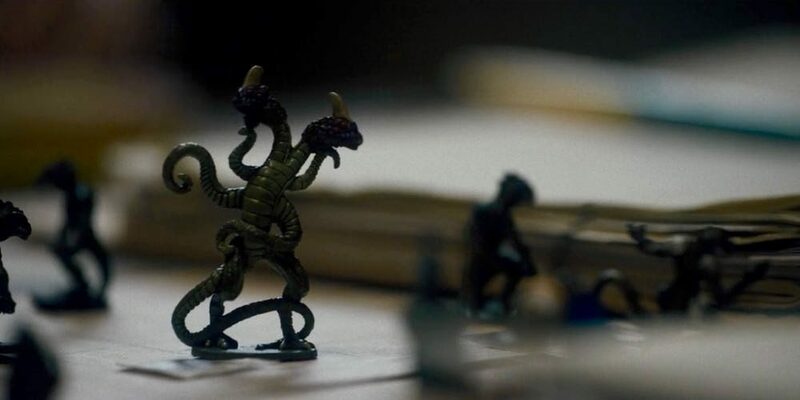 The link for Mirliton above links you to the miniatures for the Demogorgon used in Stranger Things. From the D&D Miniatures Game, pre-painted plastic miniatures. From 4th Edition, what I use all the time, the Monster Vault: a pack of more tokens representing PCs and NPCs than you could ever need. This is tougher to find at a good price right now, but you can get it in pdf (and print them) here. Or there are a few “collectible” copies on Amazon at a reasonable price. Again, there are other options out there, but these are what I use. In the end, using miniatures will greatly enhance your AD&D experience. It’s certainly enhancing ours, as Gygax himself informed us. So figure out your preferences for your miniatures and get out there and buy some! Next time: grid maps! I know you can’t wait. There’s also the short-lived D&D Attack Wing game. Since it didn’t really take off (*rimshot*), quite a few of those miniatures are out there for clearance prices. They use the transparent bases of X-Wing/Star Trek Attack Wing so you also have the added bonus of getting flying dragons. I kind of wish they’d implemented attack wing into their annual campaigns instead of those randomized boxes. I’m sure collectible randomization is a big money maker but it would be great to have exactly the miniatures you need for a campaign easily available (and usable for a skirmish game besides). Also, still trying to find a properly scaled cow miniature for Cunningham’s mount/companion/deity. Great tip on Attack Wing! Hadn’t thought of that! $20 says eBay is a decent bet for the cow…or the Playtime store in Covington has small animal figures that I’ve used for companions in D&D.